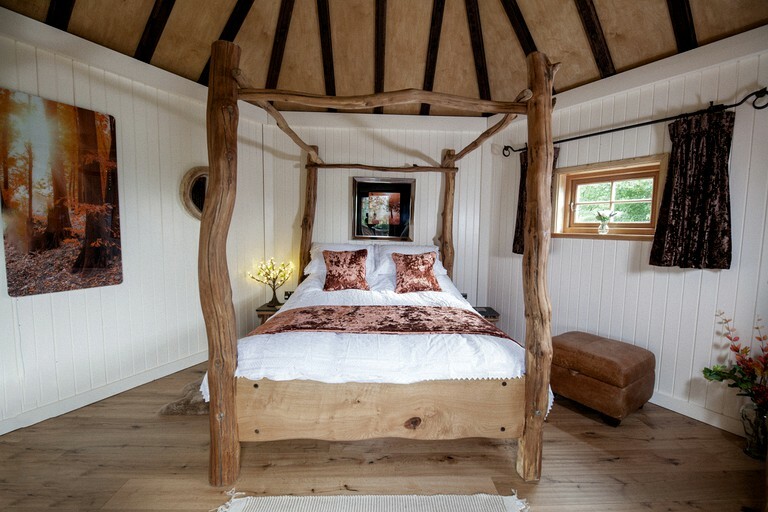 This unforgettable tree house hideaway is located in southern England in the county of Wiltshire on a beautiful organic farm. It can accommodate six guests within the three-level luxury rental. The three bedrooms have beautiful views outside and elegant woodland decor throughout. The master bedroom is level with the living area and has a four-poster bed with beautifully crafted furniture. Upstairs, there is another bedroom with two single beds, and on the lower level, the third bedroom comes with two single beds that can form to be a double bed. 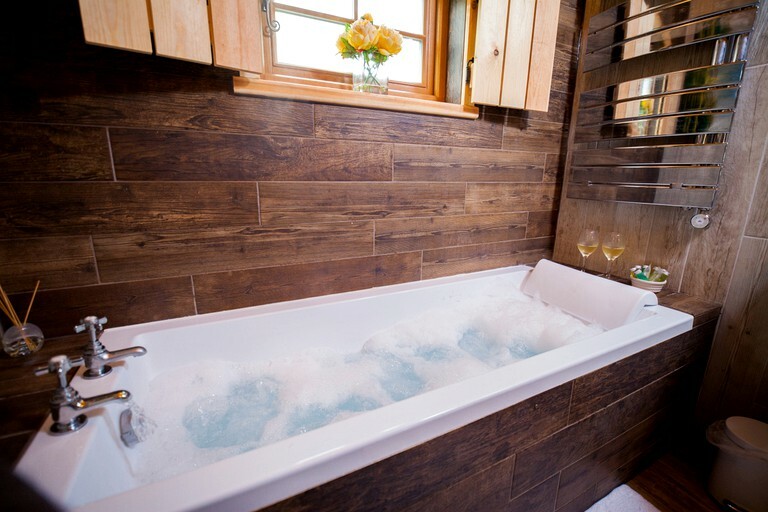 In the bathroom, there is a whirlpool bathroom and rainfall shower. When guests enter the tree house, there is a large living and dining area with a comfortable couch, wood stove, and tree table to eat at. Guests will be blown away by the breathtaking wood furnishing throughout, from the seating to the tree of lights in the center. 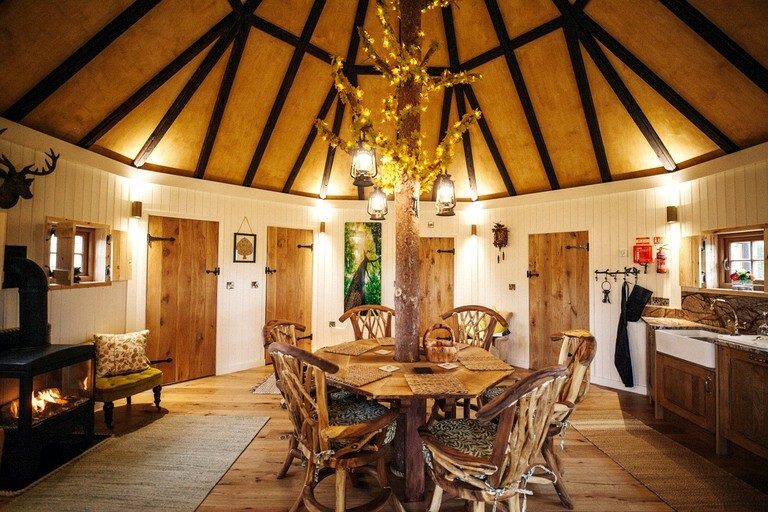 Guests will have access to everything they will need during their stay at this glamping site. This includes parking and even farm fresh eggs to cook up for breakfast. All linens are provided by the hosts. Guests under 10 can enjoy donkey rides for an additional fee. There is a shop at the property where guests can buy fresh bread, butter, milk, cakes, cheeses, quiches, honey, jams, and pickles. There is also a fridge packed full of local sausages, bacon, chicken, and beef for guests to cook on the stove. Guests can enjoy clay pigeon shooting at the site. The guns are deactivated, 12 bore shotguns and are operator controlled in all aspects, including noise level. The system is just like real clay pigeon shooting but in a completely safe environment, which all the family can enjoy. Suitable for ages five and above it costs just £5.00 per person for 50 clays. There are a range of Gator tractors for guests to enjoy. They come in several sizes and can be hired for various amounts of time. Gourmet chefs will delight in the two smoker barrels which can be hired out for £15. Instructions on how to use them will be supplied. A cooking pot is also available for £10 per night. Bikes are available for hire during a stay and guests should book them on arrival at the farm. Prices for adults are £8.50 per day and it costs £5.50 for a child per day. A child seat can be hired for £3.50 a day. All outdoor campfires will require a fire cradle, which can be hired from the shop. 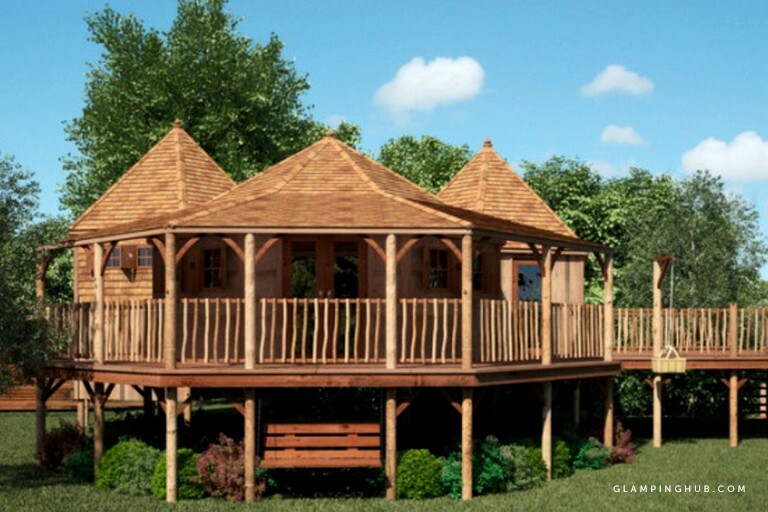 The price is £10.00 per day, including wood. 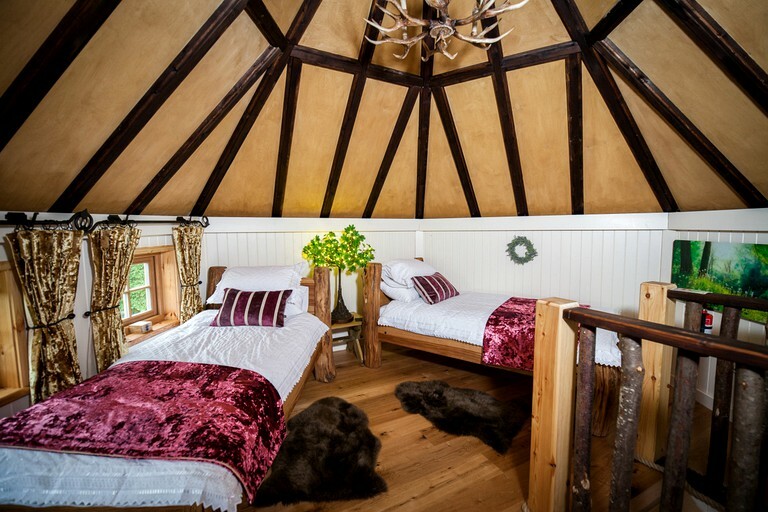 There really is no end to the fun waiting to be had at this family-friendly glamping site. The hosts are happy to give guests a tour of the farm and encourage guests to help with feeding the animals. Younger glampers are sure to delight in the straw play arena that offers traditional farm fun whatever the weather. Hiking and cycling from the property are the perfect way to explore the beautiful scenery. In the local area, guests will also find countless opportunities for day trips. The village of Lacock truly belongs on a postcard and exploring its quaint streets and churches is the perfect way to get a real feel for the English countryside. Longleat Safari Park is just 19.3 miles from the farm, and the many animals and activities are sure to please glampers of all ages. In addition, the world heritage site of Stonehenge, set on the beautiful Salisbury Plain, is one of the U.K.’s most famous and best-loved sights and can be accessed in just 20 minutes. Check-in is between 4 pm. and 6 pm.